Craig Dougherty, President of NorthCountry Whitetails, will share his expert land management advice on Bass Pro Shops Outdoor World radio. This episode of Bass Pro Shops Outdoor World will air Saturday, May 10 at 10 a.m. and 5 p.m. Eastern time on RURAL RADIO’s SiriusXM channel 80. Craig Dougherty, author and President of NorthCountry Whitetails. Dougherty, author of two books on managing whitetail habitat and hunting big bucks, cuts through the stack of information about these topics to give listeners what they need to know to succeed. In addition, Dougherty, past chairman and current board member of Quality Deer Management Association, also discusses the opportunities crossbows provide. Each week, Bass Pro Shops Outdoor World draws upon outdoor experts from across the country, including those within the Bass Pro Shops family. Rob Keck, Bass Pro Shops’ director of conservation and a Redhead® pro hunter, and his guests provide listeners with the latest information about hunting, fishing and wildlife conservation. Tammy Sapp has worked as an outdoor writer, photographer and communications professional throughout her 26-year career. She worked for the Oklahoma Department of Wildlife Conservation for more than a decade before accepting the challenge to grow the communications department for the National Wild Turkey Federation. Today, she coordinates communications efforts for Bass Pro Shops, the outdoor retail leader in hunting, camping, nature gifts, and outdoor cooking. 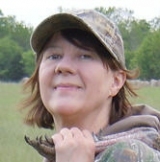 An avid hunter, angler, paddler and recreational shooter, Tammy has a passion for conservation and sharing our outdoor traditions.